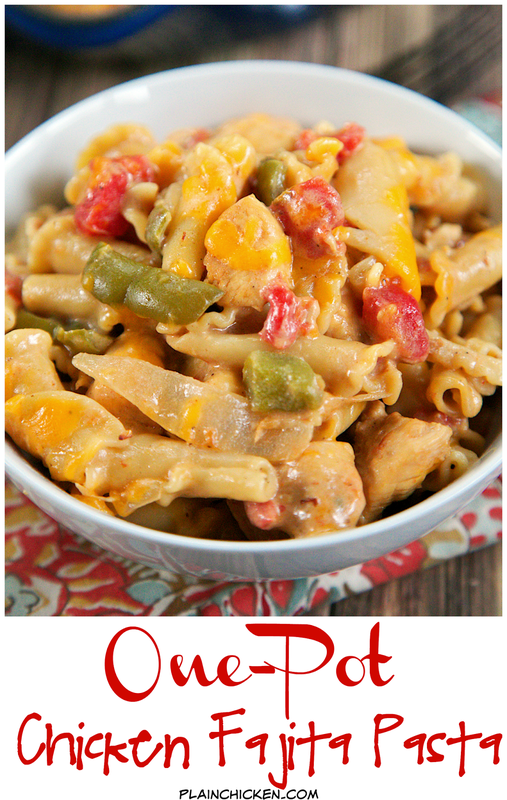 One-Pot Chicken Fajita Pasta Recipe - everything cooks in the same pan, even the pasta! Ready in under 20 minutes!! Chicken, onions, peppers, Rotel, fajita seasoning, chicken broth, cream, pasta, sour cream and cheese. Everyone gobbled this up! Quick, easy and delicious Mexican meal! 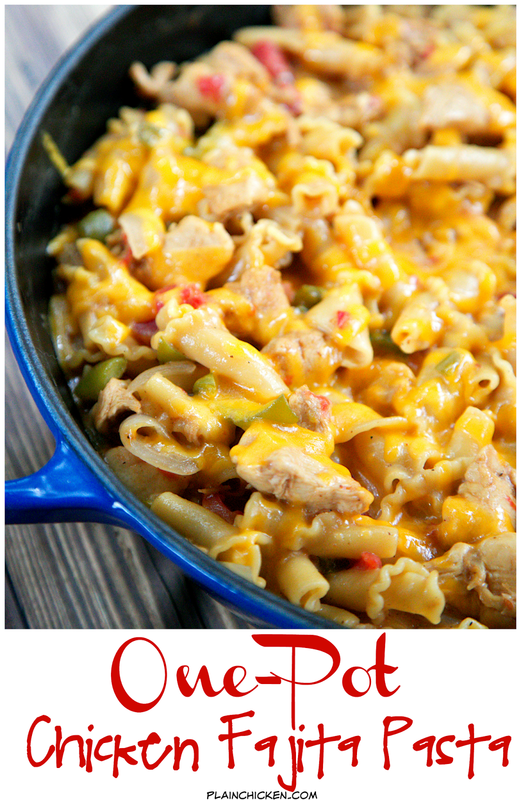 One pot meals are one of my favorite weeknight meals to make. They are super quick and only dirty up one pan! Woohoo!! Chicken Legs especially loves fewer pans to clean. On my last trip home, my Mom gave me some of her bell peppers. I chopped them up and froze them for later. 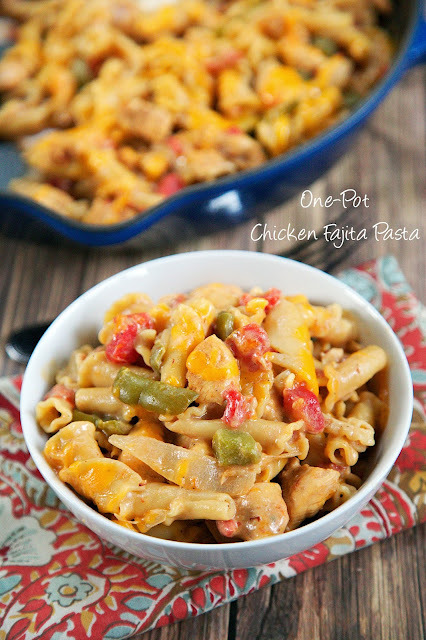 I ended up using them in this One-Pot Chicken Fajita Pasta. I am a total sucker for chicken fajitas. I can eat way too much of them at the Mexican restaurant. 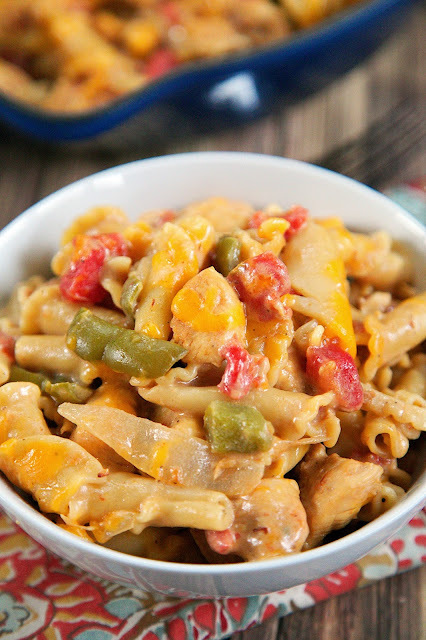 This chicken fajita pasta is equally delicious. Everything cooks in the same skillet, even the pasta. It is ready for the table in about 20 minutes! I cooked the chicken with some onions and peppers. I added a packet of fajita seasoning, Rotel, chicken broth, cream and pasta. I let it simmer for about 15 minutes then stirred in some sour cream and cheese, because I love sour cream and cheese on my fajitas! OMG! This is SO good. I ate way too much of this, but it was totally worth it. I saved the leftover for lunch the next day and it reheated great. Heat oil in large skillet over medium-high heat. Add chicken, onion and pepper. Cook for about 3 or 4 minutes. Add fajita seasoning, Rotel, chicken broth, heavy cream and uncooked pasta; stir. Bring to a boil, reduce heat to simmer. Cover and cook for 15 to 17 minutes, until pasta is tender and most of the liquid is absorbed. Stir in sour cream and cheese. Serve immediately. My fajitas include red, yellow and orange peppers as well as green. Mucho better flavor! I made this for supper last night, and it was delicious! I used taco seasoning instead of fajita seasoning because it was on hand. Next time I'll definitely try the fajita seasoning. This is going in the regular dinner rotation!